This image is an investigation of the subgroup structure of the icosahedral group (A5). At the center of the image is a graphical representation of A5, as formed by orientation-preserving pairs of reflections in circles and lines in the plane. 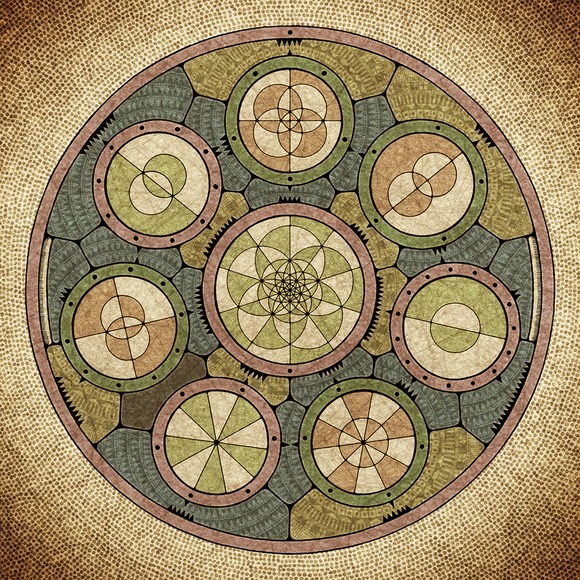 This is surrounded by similar graphical representations of the seven conjugacy classes of (proper, non-trivial) subgroups of A5, with the trivial group depicted as the space outside of the large circular frame. The interstices between the group images indicate the relationships of inclusion between the different groups, with colors being used to distinguish maximal subgroup relationships, and small graphical markers used to indicate the particular numbers of conjugates involved in each relationship.